Hungarian food is comfort food at its best… We’re talking rich, flavorful, and satisfying, a stick-to-your-ribs kind of nourishment that is perfect for cold and rainy fall weather. I have to confess, I’ve been holding out on you with my family’s goulash recipe — mainly because my mom was adamantly against sharing it. But I recently caught her in a moment of weakness, and she finally gave me her blessing to post it, so look for that soon! Today, though, I’ve got a different (but no less amazing) Hungarian recipe for you: chicken paprikash. We’re talking tender pieces of chicken, covered in a thick, rich, and creamy sauce that is flavored with delicate Hungarian sweet paprika — and lots of it! I like to think of it as the Hungarian version of beef stroganoff… Only with chicken. And spicier. Chicken paprikash is traditionally served over dumplings (aka spaetzle or spätzle, depending where you hail from) or broad egg noodles. When I’m making chicken paprikash on a weeknight — and this is totally a doable weeknight dinner — I always go for No Yolks noodles. My mom was always a fan of these high quality noodles that consistently cook up smooth, firm and fluffy, as am I today. I adore their versatility — they stay firm and delicious in everything from fried cabbage and noodles to chicken noodle soup. No Yolks noodles are made from egg whites, so they contain no cholesterol and are low in fat and sodium. I use the No Yolks Broad noodles most often, but they also come in Extra Broad, Fine, Kluski, Dumplings, and Stir-Fry cuts. No Yolks definitely has a noodle for every recipe — AND right now you can print a coupon to save $0.50 on your next No Yolks purchase! I’ll spare you the step-by-step directions for the recipe card below, but here’s the main thing to know — you must have good quality Hungarian sweet paprika to make this recipe. Seriously, NO SUBSTITUTIONS! You can usually find it in the ethnic section of your grocery store, but if not, order some online. Also, truly authentic Hungarian chicken paprikash would be made with lard and bone-in chicken legs, thighs, breast, and back (which would take far longer to cook through). So to make this weeknight friendly, I use butter (real butter, don’t even think about trying those faux spreads) and a combination of diced chicken breasts and chicken thighs. You still get all of the flavor with less mess and fuss! One bite and I think you’ll fall in love, too… I mean chicken, fluffy No Yolks noodles, plus a creamy, spicy sauce — how can you go wrong? Try it ASAP and let me know what you think. PIN IT NOW! 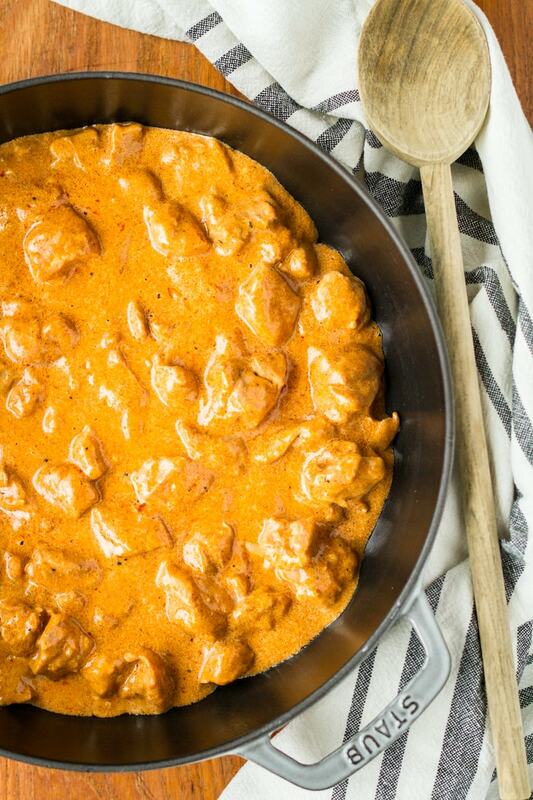 CLICK HERE TO ADD THIS HUNGARIAN CHICKEN PAPRIKASH RECIPE TO YOUR CHICKEN RECIPES BOARD ON PINTEREST! 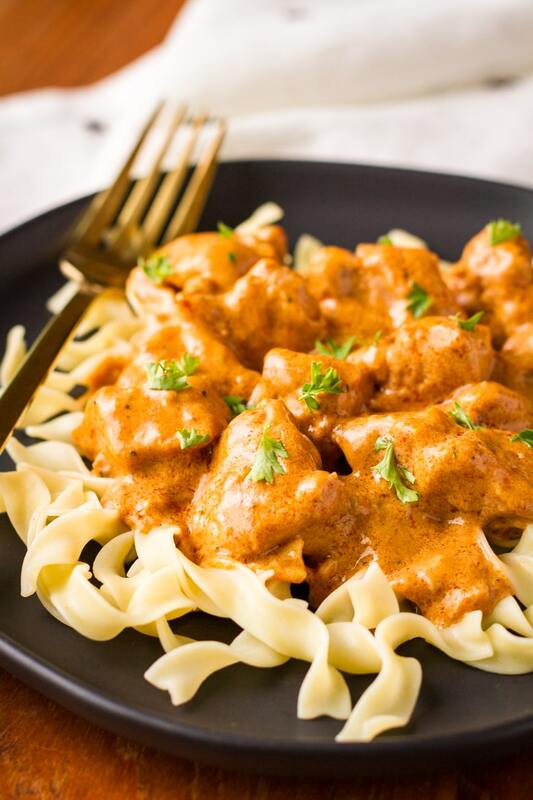 An authentic Hungarian chicken paprikash recipe using traditional Hungarian sweet paprika… Also known as Chicken Paprikas or Csirkepaprikás, this simple creamy chicken recipe served over broad egg noodles boasts big flavor! Dice the onion, and cut the chicken breasts and thighs into bite-size chunks. In a large skillet, sauté the onion in the butter over medium heat until translucent. Meanwhile, toss the diced chicken pieces with about two tablespoons of flour. Add the coated chicken to the pan, and brown on all sides. Once the chicken is browned, add the paprika, salt, and pepper, and stir well. Slowly add the chicken broth to the pan, and use a wooden spoon to scrape and deglaze the bottom of the skillet. Cover and simmer on low for 25 minutes. While the chicken is simmering, prepare the No Yolks noodles according to the directions on the package. Remove the chicken to a plate. Whisk about one tablespoon of flour into the drippings left in the skillet to thicken. Turn off the heat and stir in the sour cream. Add the chicken back to the sauce and stir to coat. Serve immediately over broad eggs noodles. I’d love to see how your chicken paprikash turns out… Tag me @Unsophisticook on Instagram or use the hashtags #NoOtherNoodle and #Unsophisticook so I can check it out. Enjoy! I think the missing taste is peppers. Green ones. I blend the onions and peppers, that way not visible. But the flavor is there. Hmm, I’ve not heard of using green peppers in Chicken Paprikash. Sounds yummy, though — I’ll have to try it! My husband’s great grandparents came over from Austria-Hungary so he grew up on Chicken Paprikash. This is the first time I ever made it and he loved this recipe. I bought the Hungarian Sweet Paprika…. didn’t realize how much of a difference there was to the “regular” sort. Very yummy dish…thanks for sharing! I’m SO happy to hear this, Debra! Thanks so much for coming back to share with me. I made this recipe tonight and I loved it! I’m vegetarian and also trying to work on eating healthier so I made a few changes — used fake “chicken,” greek yogurt instead of sour cream, and whole wheat noodles. But even with the changes, it still turned out so good that I can only imagine how delicious the original is! I recently spent 18 months living in Vienna and traveling often to Budapest so this recipe was brought back some delicious memories! Hi Amber! I’ve not tried it, and I’m not sure I’d recommend it. If you have a fancier slow cooker that allows you to sauté and then slow cook, you might be able to pull it off. But the sautéing is pretty essential to the recipe. Made tonight…good but not great…it needed something but not sure what. You can definitely leave the chicken pieces whole! You may just need to increase the cooking time to ensure the pieces are cooked through. Since I’m feeding 7, it’s just easier and faster to cook them already cut into bite-size chunks. I too grew up with Chicken Paprikash, Hungarian Ghoulash, and Cabbage and noodles. My Grandmother was a fantastic cook and she taught her daughter-in-law (my mom) these delicious recipes. We make Chicken Paprikash for every Big family get-to-gether. Great recipe! I love to hear this, Denise! My great-grandma emigrated from Austria-Hungary, and I always wish that I could go back and have her write down all of her recipes — AND the directions, lol. I have her strudel recipe, but it’s just the ingredients… Maybe one of these days I’ll master it!